On Saturday, April 27, for SFMOMA’s Slow Art Day, I led a small but insightful group of viewers through the permanent collection, including parts of the Logan Collection that are currently on display in a show titled Don’t Be Shy, Don’t Hold Back. I’m an experienced art viewer, but the method of slowly looking in silence revealed things that surprised even me. The premise for the day was to experience five pieces of art in uninterrupted silence for ten minutes apiece. 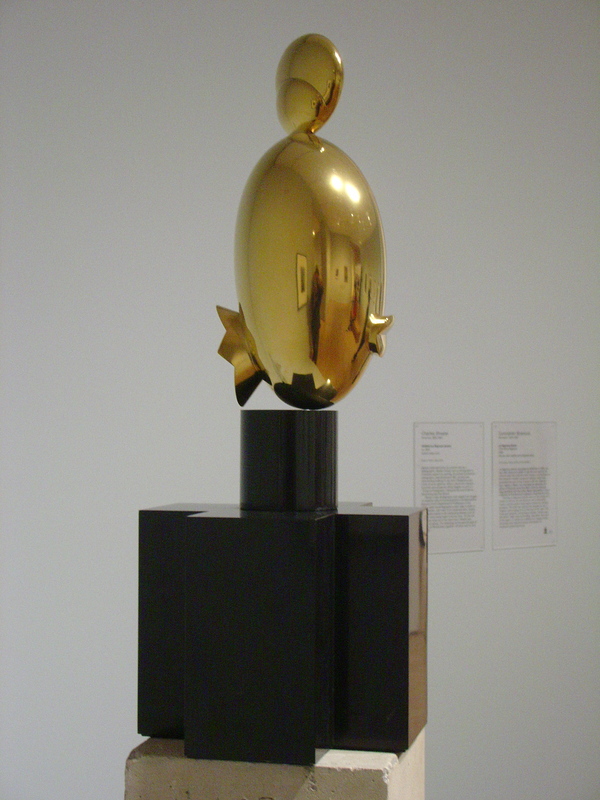 However, I slightly augmented our proposed requirements by having our group begin at Constantin Brancusi’s sculpture titled La Négresse blonde, or “the blonde black woman.” Starting there afforded us the opportunity to also view Charles Sheeler’s black-and-white photograph, displayed in the same area, of Brancusi’s seemingly flawless, shining golden sculpture. I decided to have us experience both the photograph and the sculpture for ten minutes—taking in both the two-dimensional and three-dimensional mediums in silence. The process of slow looking brought into focus things that I hadn’t planned to look at. 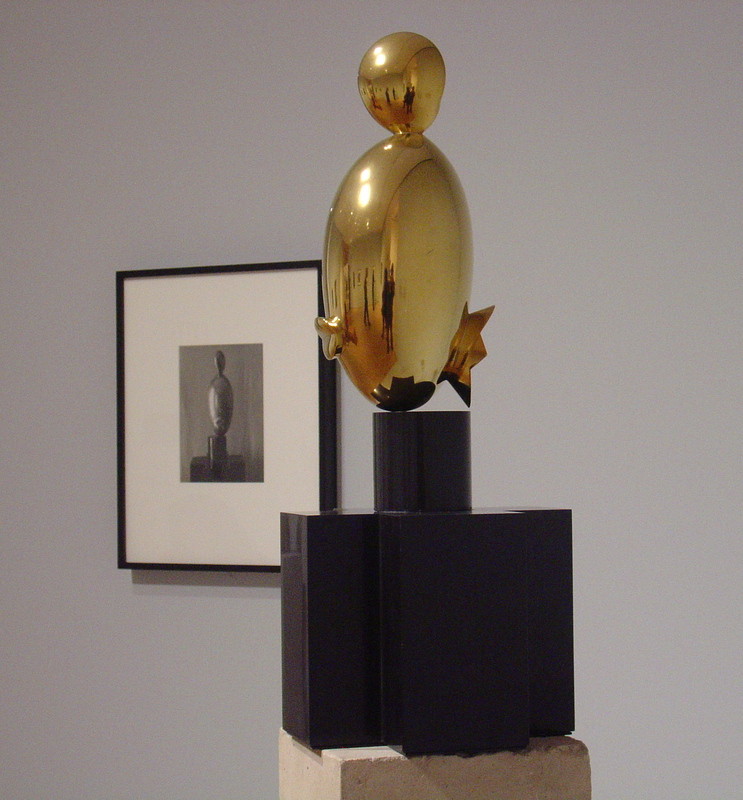 For example, I noticed that Sheeler’s photograph might be as much a subtle, unwitting self-portrait as it is a documentation of Brancusi’s sculpture. I asked myself, Is that his image reflected in the sculpture’s surface and recorded in the photo? This prompted me to turn and look at the images reflected so perfectly in the surface of the blonde négresse’s face. The flawless surface of the blonde black woman’s face helped me to look at people looking into its reflective surface—an experience that I wouldn’t have had without slow, silent, prolonged viewing. Images of Nicki Minaj, Rihanna, Erykah Badu, and Beyoncé coiffed in blond kept coming to mind as our allotted ten minutes came to an end and we moved on to view Mark Rothko’s No. 14, 1960 (1960). It is remarkable how the artwork being viewed can change your experience of the passage of time. Each piece was viewed for ten minutes, but in my estimation and the estimations of some of the participants, some felt longer than others. 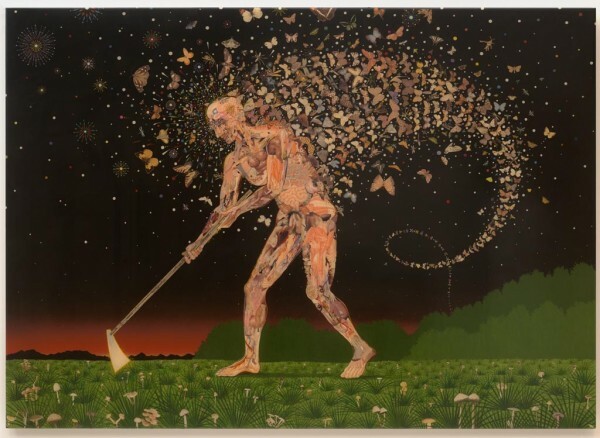 With its ambient feel, the Rothko—that artist is definitely the Brian Eno of the canonized abstract expressionist group—seemed to be just a few moments’ viewing and made for a meditative experience, while the Fred Tomaselli piece Field Guides made me feel each minute of its viewing. Not that the Tomaselli piece was any less enjoyable. In fact, I came to appreciate it more as the time elapsed and I became lost in its details. We hadn’t planned for Trisha Donnelly’s sound piece in the adjacent gallery to be such a prominent part of the experience, but it seemed to break the silence at dramatic moments in our slow viewing and made the Rothko piece, for example, feel like the sun setting over a body of water. However, the rising electronic crescendo of Donnelly’s piece made the Tomaselli seem even more manic and teeming with life. As many years as I’ve spent going to galleries and museums, I’ve never had the experience with art pieces that I had while slow viewing. I’ve resolved to go back and experience other pieces that I’ve enjoyed over the years. I realize now that I rarely have the opportunity to do gallery viewing uninterrupted for several minutes in silence. And when I do, the piece opens up not just its own subtle, surreptitious minutia but also opens to other associated experiences. Full attention gives the art piece the power to become a catalyst for a larger experience. Duane, what a picturesque comparison you draw between Brancusi and Rihanna; so glad you included this.